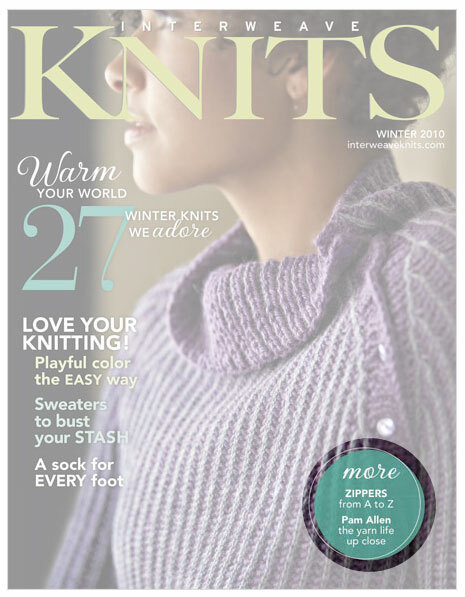 The current issue of Interweave Knits has an article (by me) about installing zippers without any sewing at all, using a very special kind of very small latch hook called a "knit-picker." 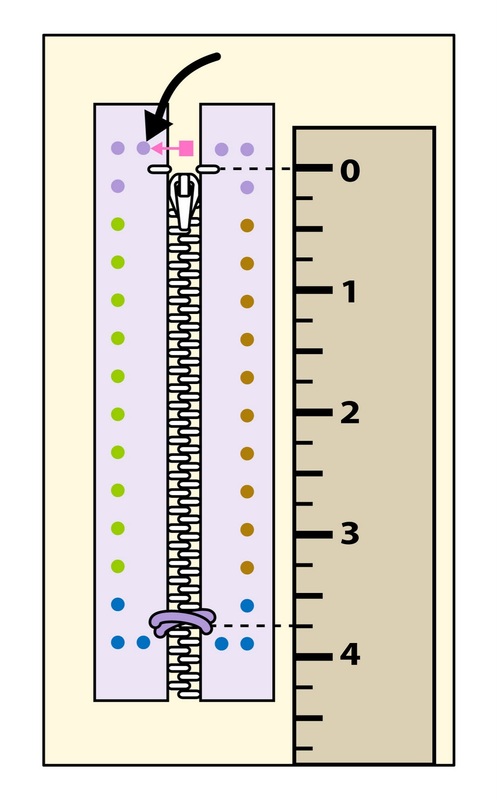 There are two different methods described in the article for installing zippers: working from the zipper outward, or installing a zipper in an already-made item. There is also an Interweave Knits video on the technique. 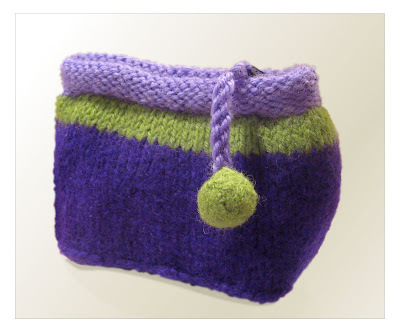 If you have a copy of the article, or have viewed the video, and would like to explore the method of working from the zipper outward, here is a pattern for a little felted purse using that technique. The project is presented as a KAL (knit along) in several installments. Today, we'll lay out the materials and get as far as the top trim. With its flat bottom, this little purse is roomy beyond expectation: a cell phone and other necessaries fit neatly alongside bills and change. Made up in an afternoon, these are great for gifts too. The average finished size is 3" (L) x 2.5" (H) x 2.25" (W) but this can vary by as much as 1/4 inch larger or smaller in each measurement, depending on how much felting you choose to do. Shorten zipper to 3 3/4 inches working length as shown in the Interweave Knits article, or however you usually shorten a zipper. Superwash top trim: Using smaller dpn's, mini-latch hook (aka "knit-picker") and the knitting needle method described in the Interweave Knits article, and using 1 dpn for each side of zipper tape, pick up 1 st for each dot. Begin the pick up at the arrow, working down the left zipper tape first. Ignore the square and different colors for the moment: for the purpose of picking up stitches, each dot equals one loop to be picked up through the zipper tape. 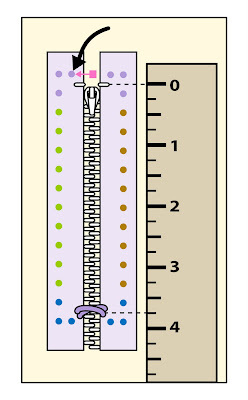 Per illustration 2, above, once you have picked up the stitches through the zipper tape, it should look like this, with one needle holding all the stitches on one side of the zipper tape, and a second needle holding all the stitches from the other side of the tape. Arrange the picked up sts on 4 dpn's: 6 across each end and 10 along each side. Needle 1 holds purple dot stitches; needle 2, green dot stitches; needle 3, blue dot stitches; needle 4, brown dot stitches. You could re-arrange the stitches onto the four dpn's by sliding the six end loops around onto their respective needles, but these loops are tight, and it's easy to lose one. Therefore, in practice, the easiest way is to re-arrange the stitches by is by knitting them off when working the second round. Bring yarn through zipper tape opening at pink square and commence to knit in direction of pink arrow as follows: Work 1 st in each of the 3 purple dot sts on needle 1, kfb in each of the 10 green dot stitches on needle 2, work 1 st in each of the 6 blue dot sts on needle 3, kfb in each of the 10 brown dot sts on needle 4, end round by working 1 st on each of the 3 remaining purple dot stitches on needle 1, you'll have 52 total sts on needles. Work for 7 add'l rounds, knitting plain. Bind off. Top trim made. Note: the trim lies purl side out, with the knit side curling towards the zipper teeth, as shown in the opening illustration. Would you like to learn to insert zippers into knitwear with NO SEWING? If your answer is yes, you have several ways to learn! 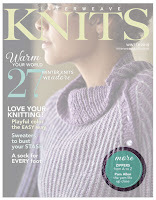 Method 1: On November 30, 2010, stop by your favorite newsstand and pick up a copy of Interweave Knits magazine. In a "Beyond the Basics" feature article which I have written, the full instructions appear. I'm pretty excited about sharing this method with you--it's taken a lot of years to figure it out, and it's pretty nifty to be able to create zippered knitwear with absolutely no sewing whatsoever. For real! None. Nada. No sewing. Method 2: The second method to learn this new technique will take place on April 30, 2011, when you can attend a workshop on installing zippers at the Minnesota Knitter's Guild 25th anniversary "Yarn Over" teaching event. In my first foray into teaching in a LONG time, I'll be giving two workshops, actually. One will be about lots of different tips and tricks of the kind popularized on this blog, and the other will be on buttonholes (including the tulip buttonhole) as well as buttonhole alternatives and zippers. The sign up is not yet open, but if you are a member of the Minnesota Knitter's Guild, you get first dibs at signing up. For further information, you can also visit the Yarnover group on Ravelry. Method 3: (updated December 23, 2010) There is a new video featuring Eunny Jang, the Interweave Knits editor, demonstrating the no-sew zipper technique. Here's hoping you will like the new method, and I hope to meet some of you in real life at the 25th anniversary Yarnover event button/buttonhole/zipper workshop (or the tips and tricks workshop!) April 30, 2011.